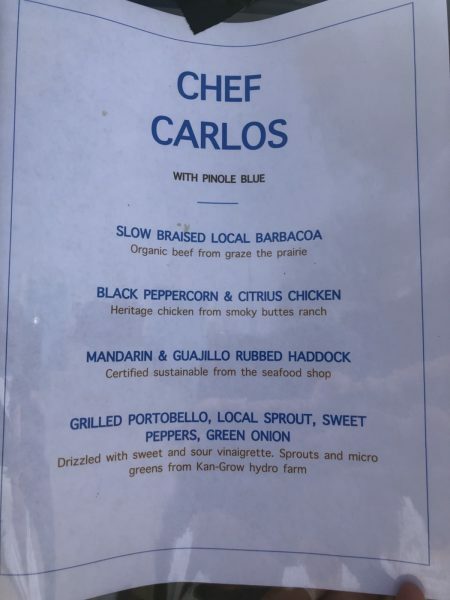 Pinole Blue’s pop up is a true taco delight – Wichita By E.B. You may have heard of Pinole Blue. It’s a local business that specializes in blue corn tortillas. 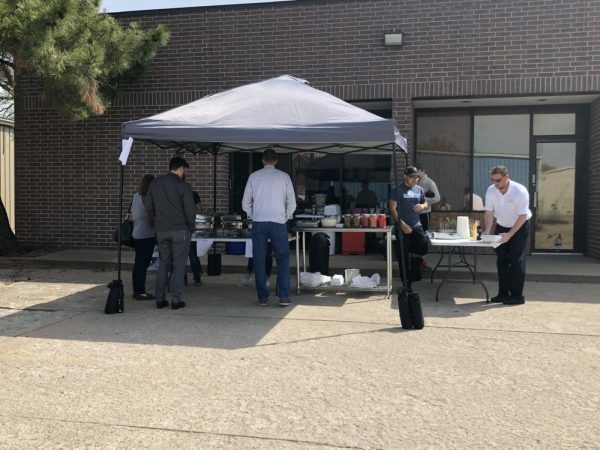 For a couple months now, they have been hosting a little pop up outside of their building and serving creative $2 tacos. The pop ups take place every other week on Fridays. h from 10am to 2pm according to their Facebook. If it is something you try at least once because of this blog, I highly recommend this taco pop up. Let’s just get the menu out of the way. 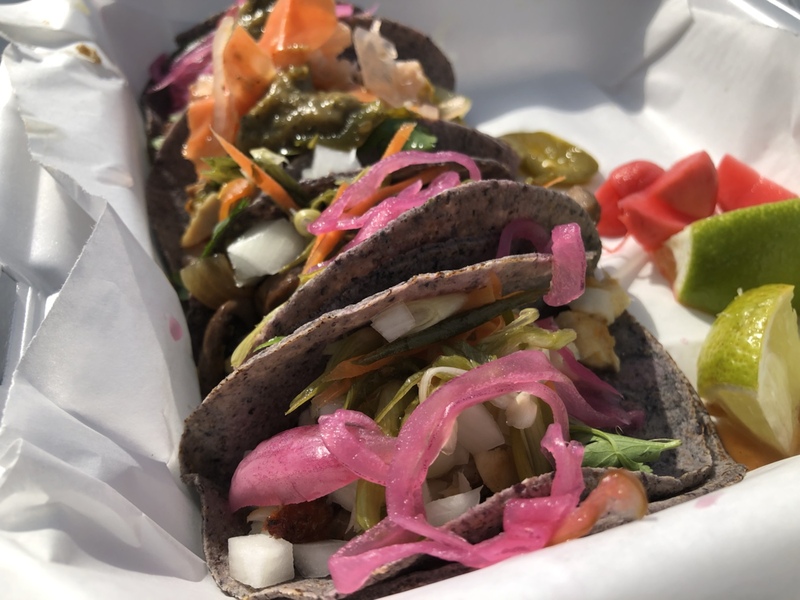 All of the tacos are served on tortillas made of course by Pinole Blue Stone ground, heirloom corn, Non-GMO, preservative free. 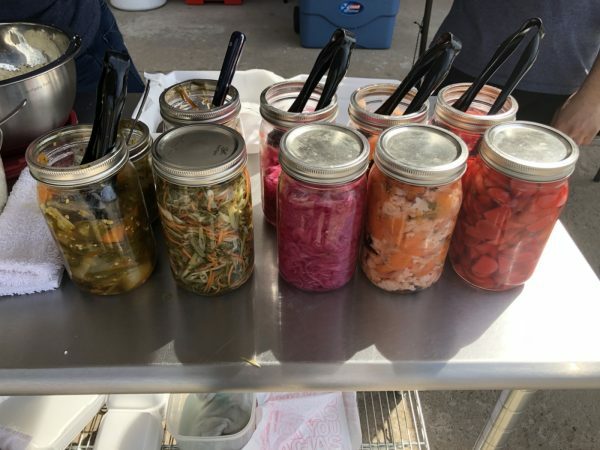 The ingredients on the tacos include many local places like The Seafood Shop and Kan-Grow HydroFarm. The fact that they can keep it local and price it out at $2 a taco was really impressive to me. Often times “local” can increase the prices but not in this case. All tacos ordered come with your standard cilantro, lime and onion. But they also have chef made toppings that all tasted amazing. Hot and Sweet Radishes: red radishes pickled with red wine vinegar, palm sugar and chiles. Best enjoyed as a pallet cleanser or snack in between bites. Anytime I see a menu of four tacos, I’m going to order one of each. As for the toppings, I asked them to surprise me with whatever. The end result was a container of some of the most colorful and vibrant tacos I’ve ever seen. My biggest mistake was not ordering more tacos because I enjoyed every single one of them. They are certainly different than your regular street corner tacos you’ll find but that wasn’t their goal. 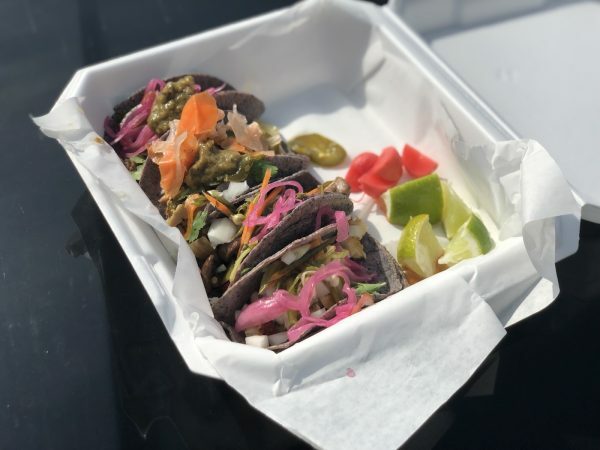 To me, they were like gourmet, creative, unique and visually appealing street tacos without the “gourmet” price. The chef made toppings added a huge spark and offered so many different wonderful flavors that I may have to go back and see if they’d be open to selling jars of them. The tortillas which are organic were just like any great tortilla I’ve ever had. Aside from the color which is nothing, I’d wager to say the tortillas were possibly even better than what many restaurants serve. I see a blind taste test in my future between many of the tortillerias in town. Seriously, give these guys a try at least once. This will be my go to spot for every other Friday moving forward. Who’s with me? Be sure to follow them on Facebook to see their pop up schedule.